It was an honor to represent Guilford College and the ECAR minor at a United Nations conference this summer. The conference hall was filled with experts, diplomats and passionate students who are all striving to include refugees in their communities. The projects that were presented at the UN demonstrated that I have much more to learn about refugees. The panel discussions, the talks and the presentations opened my mind to different ways to welcome refugees into our community. The project that resonated with me the most was the project of the University of Pennsylvania to encourage universities to hire refugees. 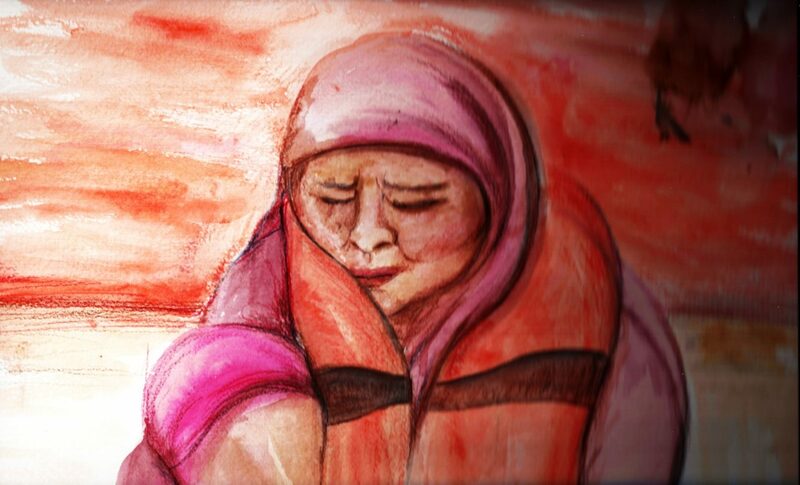 I look forward to seeing what Guilford will do for the refugees in Greensboro. I was honored to be able to speak about the Every Campus a Refuge minor at the UN, as well as for the opportunity to hear about other schools’ initiatives. At a networking lunch, we were able to share the story and mission of ECAR, hopefully planting the seed for the organization to continue to grow at these institutions already working hard in various ways to alleviate refugee issues. 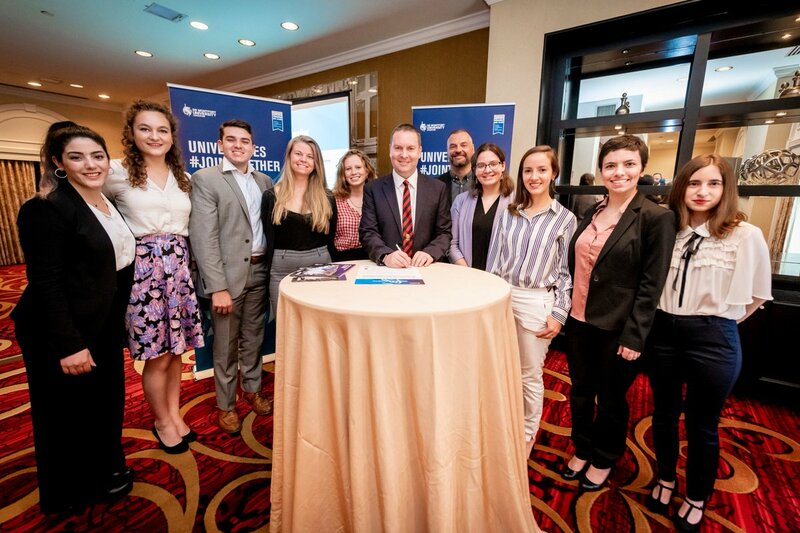 One of my favorite parts of the UN Summit was being able to meet students from other universities and organizations and learning about how they run their organizations as well as how we can incorportate some of those ideas into ECAR. It was also incredibly humbling to be at the United Nations and hear such inspiring panels with distinguished speakers such as Maher Nasser, Daniël Prins, and Jonathan Allen. Being able to hear them speak also allowed me to see that working on an international level is not only possible but realistic. 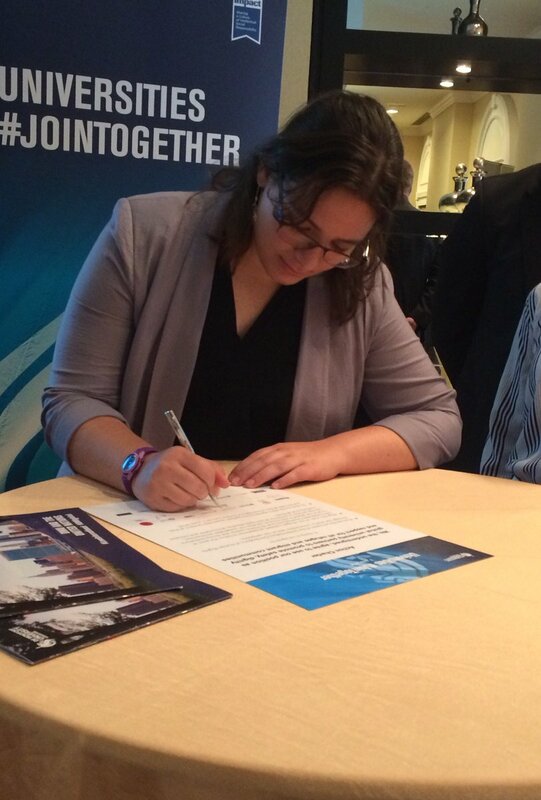 Kathleen Herbst signing the UN Together Campaign Summit Charter on behalf of Guilford College.